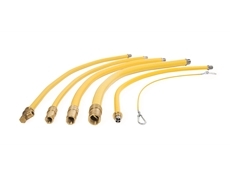 Caterhose Gas Hose Assemblies - Standard - Yellow - 1.00m x 1"
Home / Products / Plumbing Components - Commercial Kitchens / Commercial Gas Hoses - Caterhose Range / Caterhose Gas Hose Assemblies - Standard Range / Caterhose Gas Hose Assemblies - Standard - Yellow - 1.00m x 1"
> Back To Caterhose Gas Hose Assemblies - Standard - Yellow - 1.00m x 1"
Caterhose is a fully welded corrugated stainless steel hose assembly manufactured under rigorous controls to meet the requirements of gas supply for catering appliances, using 1st, 2nd and 3rd family gases. Caterhose has been tested and certified by British Gas in accordance with BS669 Pt.2 1997. 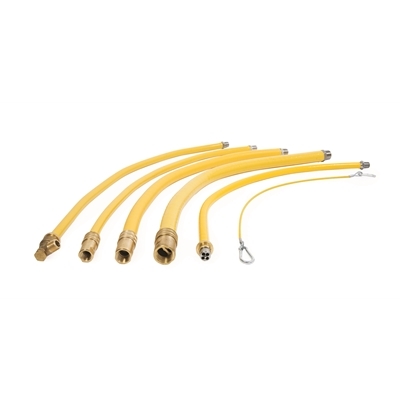 The hose is supplied with a quick release valved coupler, which cuts off the supply of gas when disconnected. Caterhose assemblies, when installed with mobile catering applicances, allow easy access for cleaning in line with health and safety regulations regarding hygiene in food establishments. Restraining wire also supplied.